The spine is an intricate framework of interlocking bones that, when viewed from the side, form a gentle "S" shape. The spine is a sophisticated system that is very sturdy consisting of muscles, bones, joints, ligaments, discs, a spinal cord, and nerves. The vertebrae, facet joints, and discs are vertically stacked in a healthy spine. Ligaments support that alignment. Discs are flexible, spongy pads, that absorb shock between the vertebrae and joints. The spine has three natural curves, which help to evenly distribute the loads incurred by daily activity—from sitting, walking, and running, to lifting and carrying. The sacrum lies at the base of your spine under the fifth lumbar vertebra. The tailbone, or coccyx, is a triangular-shaped bone under the sacrum. The sacrum and the pelvis to form the sacroiliac joints. 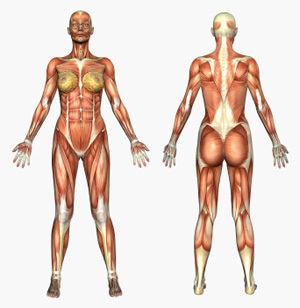 The soft tissues that envelop and support your spine make up an intricate network of muscles. With the help of your back muscles, this network helps to keep your body stabilized and upright, and allows it to bend and flex. Your nervous system looks much like electrical wires with millions of cords reaching out to every corner of your body. Your spinal cord actually ends near the base of your middle back, shooting out braids of nerves called "nerve roots." These nerve roots run through a large tunnel-like canal, and at each level of your spinal column, a pair of nerve roots exits from the spine. A healthy spinal cord allows nerve impulses to flow freely back and forth from the bottom of your feet to your brain. But when your spinal cord becomes misaligned, its parts get out of place and nerves can become pinched. When this happens, the flow of information from your nervous system gets interrupted. This imbalance, called subluxation, can lead to physical problems ranging from minor discomfort to major pain.